You are here: Home / Blog / Blog / Statistics and reality. How many people live in the Moscow region? Press release, Moscow, 23/01/2018: The population of Moscow and Moscow region has approached the mark of 20 million inhabitants according to the data of the Federal State Statistics Service (hereinafter SCS) for 2017. 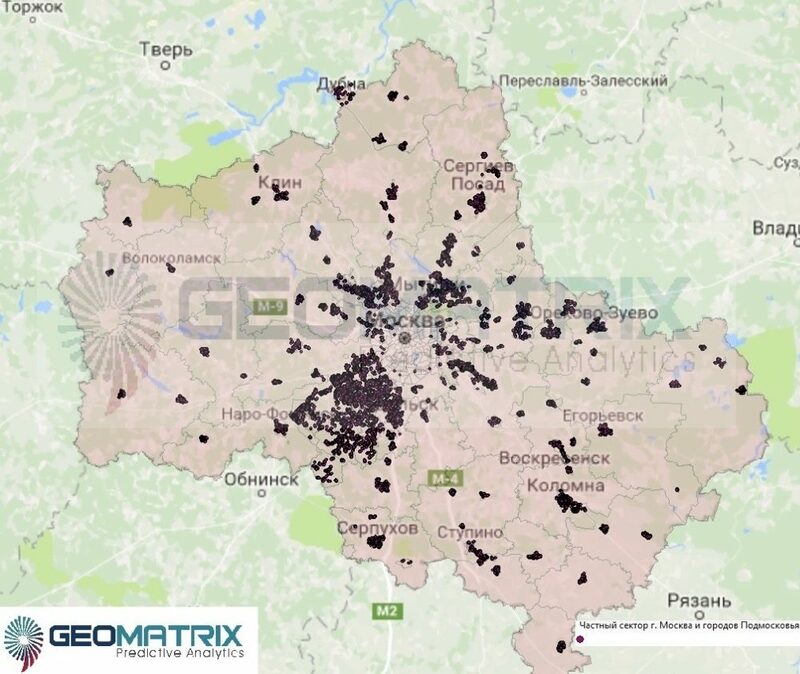 At the moment, data are published on the areas of Moscow, cities and townships of the urban type (hereinafter referred to as towns) of the Moscow region. There is no data available on the rural population at small points. How many people live behind the Moscow Ring Road within the Moscow Region? 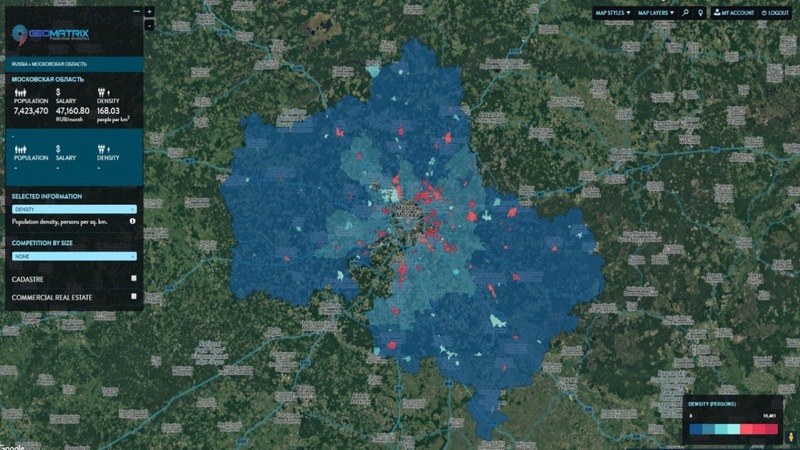 What areas of Moscow and Moscow region are actively built up and populated? The team of our cartographers carried out a voluminous and complex work on the digitization of the entire Moscow region, integration the already digitalized data of Moscow and Moscow Region large cities’ buildings. Let’s get acquainted with the main indicators of Moscow and Moscow region. According to statistics for 2017, the population of Moscow is 12,380,664 people. The density of 4,739 people per square kilometer. The data of the GCS for New Moscow lag behind the reality. The private sector takes up most of it and if we take the calculation of 1 family = 1 house, then the population is simply not enough. According to the SSC in Novaya Moskva, current population reaches 339,231 people but according to our calculations, the population in these areas should reach already 447,967 people. The table shows the GCS data and our calculations. The private sector outweighs the entire population, but there are also multi-storey buildings. Actively hand over finished houses in Balashikha, Lyubertsy and New Moscow, the farther from the capital, the less new buildings can be found. 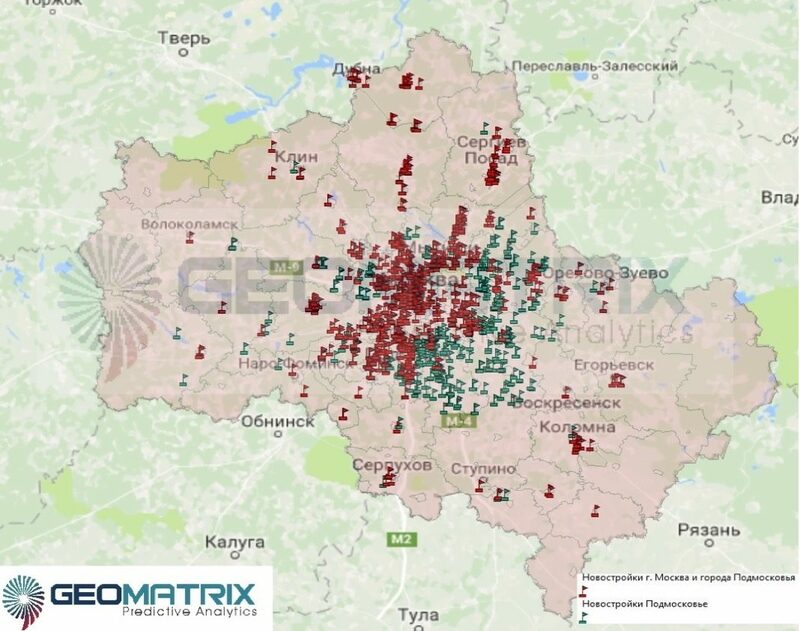 Below you can find maps with the distribution of the private sector and multi-storey buildings for Moscow and the cities of the Moscow region. On the territory of New Moscow there are many SNTs and summer villages, however, the population of the private sector is quite large. So which districts in Moscow and the Moscow region are the most densely populated? Below you will see a table with the TOP – 20 districts. Table 2. Calculating the urban population by house. The most densely populated areas and cities in Moscow and the suburbs. If you take the suburbs, then naturally there prevails private development. The number of residential private houses (excluding SNT and summer villages) is more than 530 thousand houses. Among the most actively developing areas – Ramensky, Domodedovo and Krasnogorsk. The least built-up areas in the eastern part of the Moscow region, such as Yegoryevsky and Shatursky districts. The population of the Moscow region is 7 423 470 people, the rural population is 1 360 484 people, who live in more than 4 000 settlements with a population ranging from 3 to 33 000 people. As in the case of New Moscow, for the Moscow region there is an acute shortage of people according to statistics (1 360 484 people). Based on our calculations, 730,161 inhabitants were not counted for the districts. Of course, among the private sector there are many houses that are used as holiday homes, but the number of permanent residents is usually very large. Table 3. The difference in the statistical data and calculations of Rilos in the Moscow region. Figure 6. Rural population of the Moscow region by districts, calculation by houses. The West of Moscow region is one of the key directions for the construction of new houses, both multi-storey (Krasnogorsk district) and cottage complexes (Istra district). Ramensky district is actively developing in the eastern part. The following table provides a summary of the population. Data from the GCS and our calculations. Table 5. 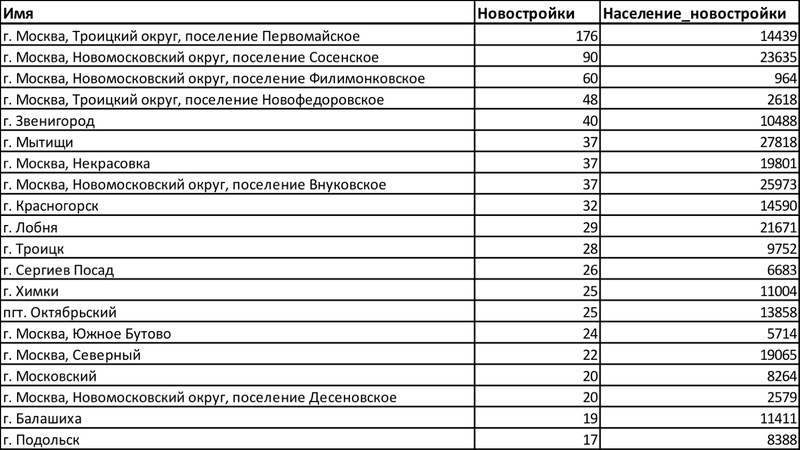 Summary table for urban and rural populations in Moscow and the Moscow region. On the territory of Moscow and in the major cities of Moscow Region, many-storeyed buildings are being built with an average number of floors equal to 17. If we talk about the Moscow region, then new buildings start from 2 floors (townhouses) and up to 14 floors on average. Balashikha is a city with a very impressive number of new houses that have already been commissioned or are under construction. Unfortunately, this negatively affects both the ecological situation and urban planning, the flow of people who go to Moscow to work only increases and creates more and more transportation problems. We made a calculation based on the volume of the building, the average footage per person, in order to obtain the values of the maximum number of potential residents in the houses under construction. 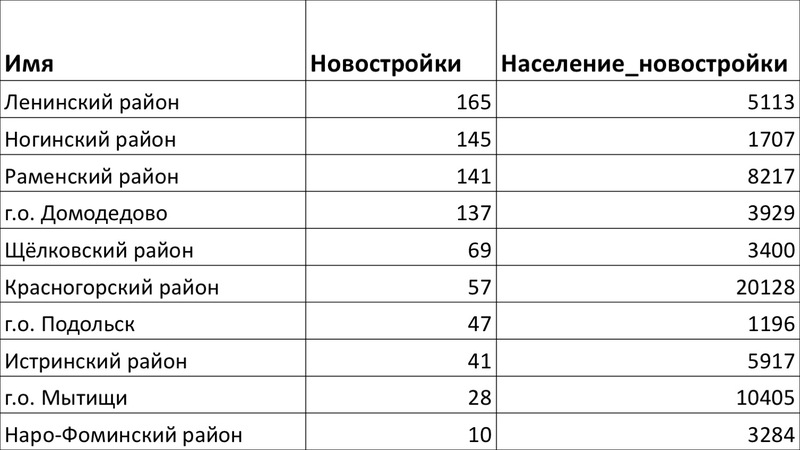 In the tables below are TOP 10 and 20 for Moscow region and Moscow. Table 6. 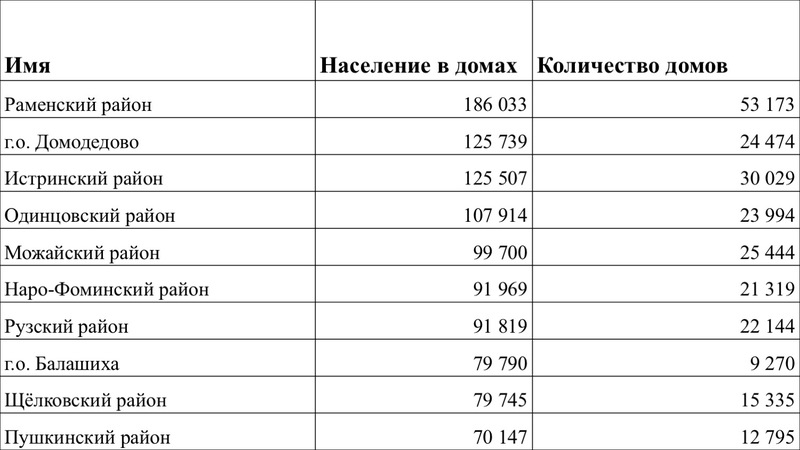 Distribution of new buildings in the suburbs of Moscow Region TOP-10 and the maximum number of people living in them. Table 7. Distribution of new buildings in the districts of Moscow and the cities of the Moscow Region TOP-20 and the maximum number of people living in them. The development of the Moscow region is swift, houses grow on any vacant lot, but often not where a real replacement of the old housing stock is required, but where the land is more expensive. The Western direction has long been considered elite. Therefore, there are so many new housing and many houses under construction. Probably, there will soon be a satiety, and this direction will slow down the pace. What will start to build further? The eastern part is in question, especially remote areas, since there is an inappropriate terrain. Peatlands, wetlands – construction costs are too expensive. The south-eastern direction is also not the most promising, industrial areas are not the most attractive. The greatest probability of development in the North, North-Eastern and Southern District. The active development of the Moscow region is a huge plus for retailers and their businesses. Potential locations for the development of the network, with good traffic, is becoming more and more. It remains only to competently approach the opening of new points. At the same time, Moscow remains the main construction site of the country. The plans of the authorities are the construction of land adjacent to the Moscow Ring Road, which may amount to 10 million square meters. housing. Moscow is creating great competition in the Moscow region in real estate, which can negatively affect the cost of housing, both there and there. In the long term, and at all to become long-term construction. And again the question arises, who will occupy all new homes? Those who fell under the renovation? Those who come to Moscow in search of a better life? The answer will be found in a few years.